Here are a few highlights of my August garden. These Oriental lilies were from an unnamed mix purchased twelve years ago. I purchased a twenty-bulb mix of Oriental lilies twelve years ago, and only a few of them remain, but they are very vigorous. I know I got them twelve years ago, because I planted them the same spring my son was born. The same spring my gall bladder acted up. It was not a very good year for getting things done in the garden, but I’m glad I planted these lilies in between gall bladder attacks and diaper changes. My daughter Cadie planted these Grandpa Otts morning glories. For at least three years, my daughter Cadie has planted several different kinds of morning glories along the chicken wire fence. So far only the Grandpa Otts is blooming. Maybe the others need more heat? If so, they’ll be getting it this week. 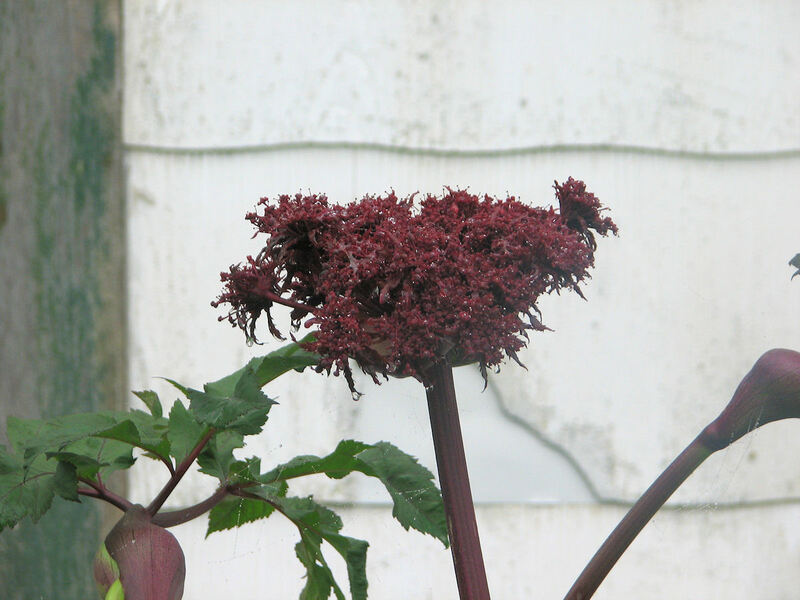 I’ve wanted Angelica gigas for years, and tried several times to grow it from seed without success. I read, more than once, that you need fresh seed to be successful. That usually means you have to know someone already growing it, who can give you seed as soon as it’s ripe. Last year I finally visited a gardener who was growing it. She did not give me seed, but seedlings, two of which wintered over in my garden, one of which has just started blooming. I’m hoping it will self sow here, and perhaps the other plant will bloom next year. It is interesting how some lilies are vigorous and others putz out after a couple seasons. With sun and well-draining soil, they should thrive, but few of us in WNY have that! I wonder if those are the Sorbonne. 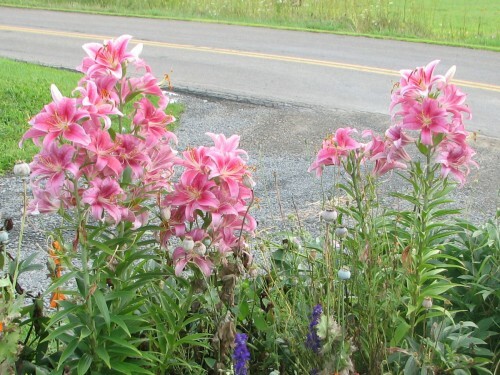 Beautiful lilies by the roadside! .-= greg draiss´s last blog ..A Pinch To Grow An Inch (Times 10) =-. I love plant memories like that. I have so many plants that someone gave me, or that I bought while on an expedition with a special gardening friend – fun fun fun! I am loving those lilies too – so gorgeous! .-= Donalyn´s last blog ..Contrast =-. Kathy, I love the deep rich colors of Grandpa Ott’s. If I grew that one, it would literally pale in comparison. Our intense sun would see to that! .-= Cindy, MCOK´s last blog ..On This August Occasion, Let Us Celebrate … =-. 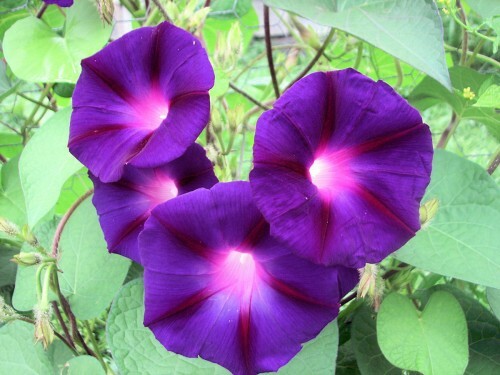 I really love the Grandpa Otts morning glories. I try to grow morning glories but get no where. They leaf out but no flowers. .-= Shady Gardener´s last blog ..Butterfly Kisses and Flutterby Good Wishes =-. I love Grandpa Ott for its ability to grow in tight little spots. I never know where it’s going to show up. 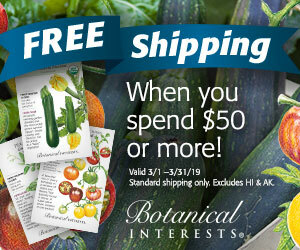 You’ve got lots of great plants in bloom. Love the lilies. I would not expect that something named Granpa Otts would be so beautiful. .-= Les´s last blog ..Boom Day – After The Deluge =-. Les, some people say Grandpa Otts is invasive. Certainly it seems more vigorous than any of the other morning glories we planted this year. Kind of ironic, seeing as it was the first seed the Wheatleys saved, that inspired them to start the Seed Saver’s Exchange. I wish we could have lilies like that for 12 years. Since they’re not named, perhaps you should name them for your son! What a great gardening family you have. I have an angelica here. It dies back at the first sign of heat but explodes in fall. .-= Linda Lehmusvirta´s last blog ..From Linda: Bloom Day August 15, 2009 =-. The lilies weren’t labeled, Linda, but they look like Stargazer and I suspect that’s what they are. And did you notice the larkspur blooming with them? That blooms for you in, what, early April? I’ve heard of Angelica but never tried to grow it in my garden. It’s a fairly large plant, isn’t it? 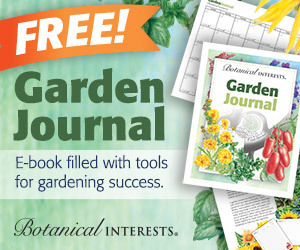 .-= Carol, May Dreams Gardens´s last blog ..Garden Bloggers’ Bloom Day – August 2009 =-. Yes, the blooming one is about five feet tall. I love the mystery Lilies, they are so full and such a great color. The Angelica is gorgeous, I hope it becomes a permanent resident. .-= Mr. McGregor’s Daughter´s last blog ..August Bloom Day -The 2d Blogaversary =-. I don’t think I’ve seen Angelica. I’ll keep an eye out for it, sounds interesting. .-= Muum´s last blog ..Garden Blogger’s Bloom Day for August 2009 =-.